Britney Fox came to L.A in 1985 via their home town of Philadelphia. 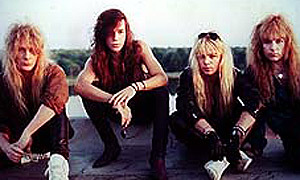 Original bandmates Singer Dizzy Dean Davidson, bassist Billy Childs and drummer Johnny Dee met guitarist Michael Kelly Smith from up-and-coming band Cinderella, who left them to join Britny Fox. The band adopted Cinderella's look and recorded their first demo. Cinderella helped the band get a record contract with Columbia, who released their self-titled debut album in 1988.